The Bombardier CRJ700 interior styling is very much standardized across all airlines that operate the CRJ700 aircraft. Most airlines now configure the CRJ700 interior with two class seating (first class and Economy/Regular Class). Inside the typical CRJ700 cabin, the first 2-3 rows / 6-9 seats are configured into a first class section in a 1 by 2 seat configuration. The rest of the seats are configured for regular seating in a 2 by 2 configuration. 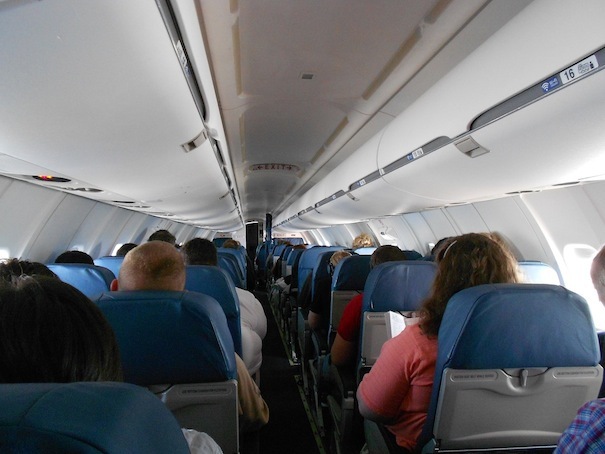 The total seating on-board the CRJ700 jet is usually 65-66 seats in the above configuration. First Class seating in the Bombardier CRJ700 interior usually has a seat pitch of 37 inches. Economy class / main cabin seat pitch is usually 31 inches. There are also airlines that operate the aircraft with only economy class seating inside the Bombardier CRJ700 cabin. Most configurations with one class have 70-78 seats. 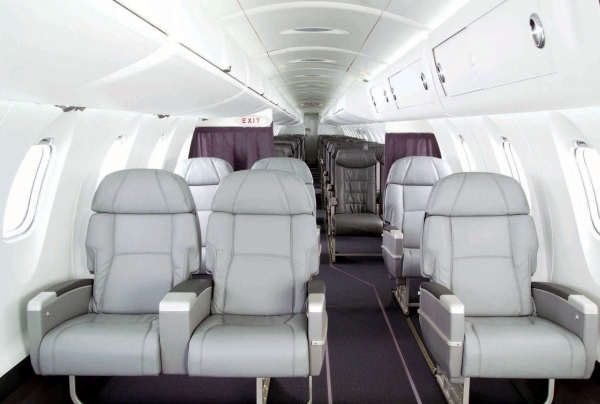 78 seats is the maximum number of seats that the CRJ700 regional jet can have. The CRJ700 interior has a height of 6 feet 2 inches, which is about 1 inch taller then the CRJ200. Most CRJ700 cabins also have one lavatory / restroom on-board. The Bombardier CRJ700 NextGen interior has been upgraded from previous versions of the CRJ700 aircraft. Larger overhead bins, windows and LED lighting are installed inside the CRJ700 NextGen interior. Above Bombardier CRJ700 Interior Photo Showcasing First Class on a CRJ700 Copyright Bombardier. Used under Fair Use. Above Bombardier CRJ700 Cabin photo by Altairkh on Wikimedia Commons. Photo (only) released under a Creative Commons License. The Bombardier CRJ700 Interior is also referred to as the Canadair CRJ700 interior, Canadair Regional Jet 700 Interior and the CL-600-2C10 Interior.